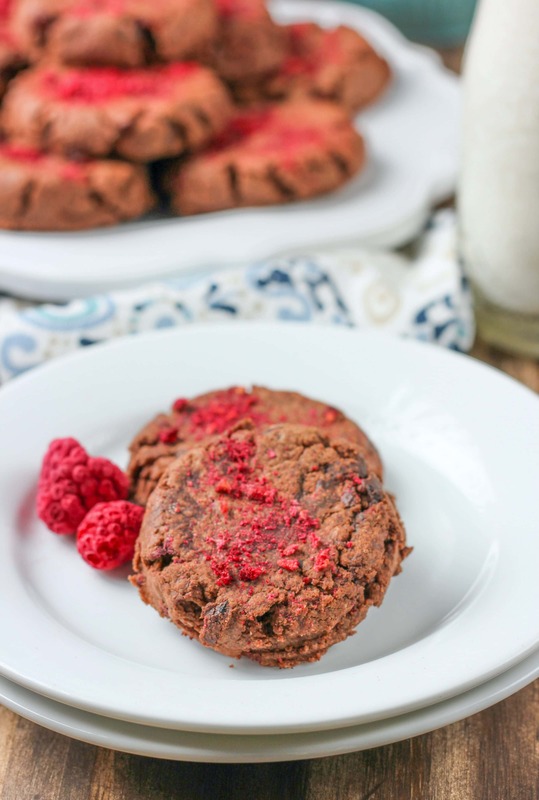 Thick, fudgy and loaded with chocolate chips and raspberries, these Raspberry Fudge Cookies are easy to make and completely irresistible! Football season is over, and it’s time to move on to the next holiday! Valentine’s Day. And whether you’re a fan of the holiday or not, I think we can all agree that it’s a pretty good excuse to make and eat chocolaty desserts! We don’t make a big deal of it around here, but I never pass up celebrating with rich, fudgy desserts. 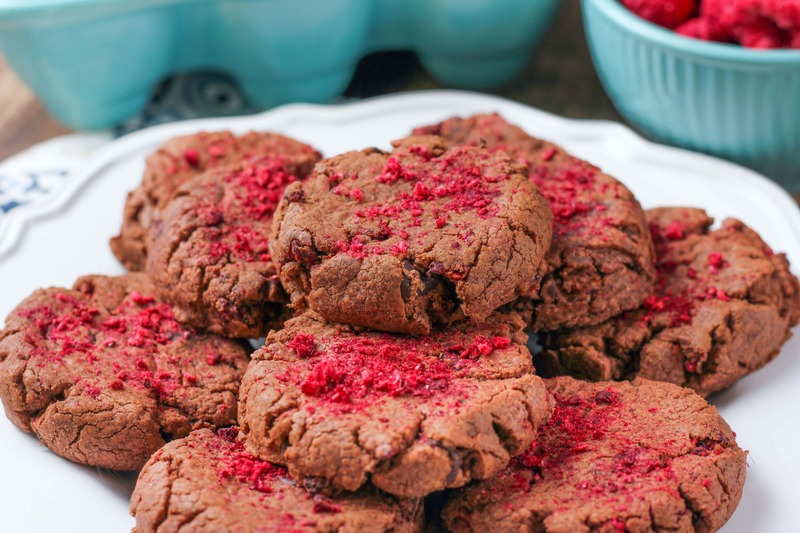 And this year it may be with another batch of these raspberry fudge cookies! They are definitely worthy of being eaten on Valentine’s Day! 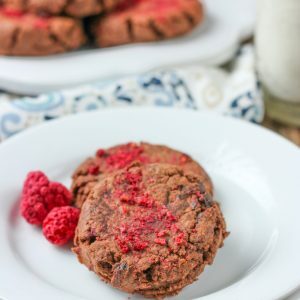 Thick, fudgy and filled with chocolate chips and freeze-dried raspberries, I think I may have found my new favorite cookie. As you know, I’m not a big cookie fan, but even I had a hard time not sneaking a cookie every time I walked past the container! The cookies get their fudgy texture from melted chocolate that is then combined with sugar and butter. They aren’t the definition of healthy, but they are worth indulging in one or two! I don’t usually combine fruit with chocolate as a first choice, but I really like chocolate with raspberries. 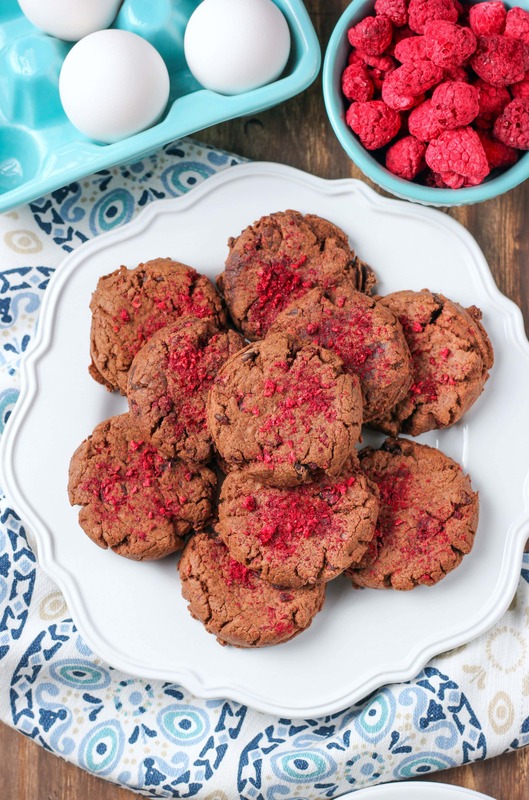 Using freeze-dried raspberries gives the cookies a bit of tartness to off-set the richness of all the chocolate. That and the vibrant pinkish-red color doesn’t hurt either! 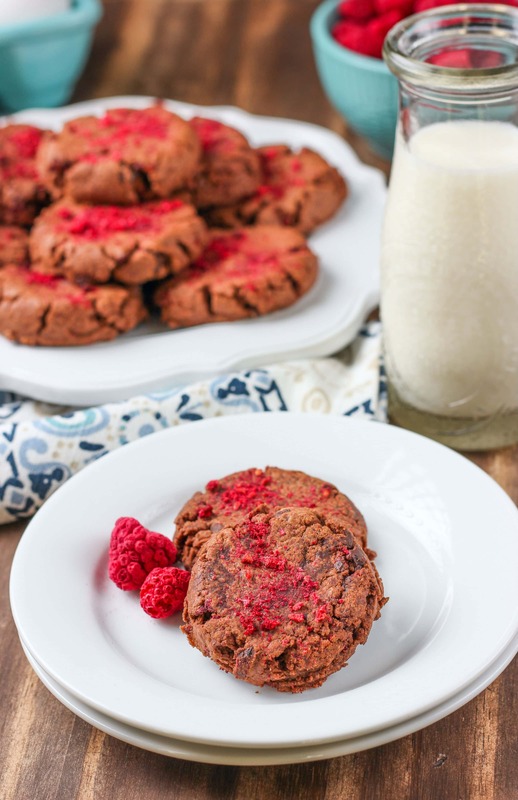 If you’re looking for a rich, irresistible chocolate cookie for Valentine’s Day, make a batch of these cookies! Actually, you may want to make a double batch, if you wanted to have some left for sharing! What makes these cookies even better is that they are made to bring awareness to Cookies for Kid’s Cancer. We’ve partnered with them for the past four years and are excited to team up with them once again by joining a group of bloggers who are doing this Valentine’s Day event in order to make a difference in the fight against pediatric cancer. Did you know that cancer is the #1 cause of death of children by disease in the U.S.? There are 40,000 U.S. children actively battling cancer right now. With less than 4% of the National Cancer Institute’s budget going to all childhood cancer combined, it’s important to get involved. Help us make a difference by donating to Cookies for Kids’ Cancer! Our goal is to raise at least $3000. Dixie Crystals, Mediavine and OXO have each pledged to match our donations raised through this campaign up to $3000 from each company! You can donate and help us make an even bigger difference! Preheat oven to 350. Line a cookie sheet with parchment paper or a silicone mat. On the stovetop, or in the microwave, melt 1½ cups chocolate chips. Set aside. In the bowl of stand mixer, or with an electric mixer, cream together butter and sugars. Add in eggs and vanilla extract. Beat until creamy. Slowly beat in melted chocolate. Do not add all of the chocolate at once, as this may cook the eggs. Beat until well-combined. In a small bowl, whisk together flour, baking powder, and salt. Add dry ingredients to wet ingredients, and beat until combined. Stir in remaining semi-sweet chocolate chips and freeze-dried raspberries. Drop by heaping tablespoonful onto prepared baking sheet. Bake for 6 minutes. Carefully remove from oven and sprinkle with crushed freeze-dried raspberries, if desired. Return to oven and bake for an additional 2 minutes, or until edges are just set. Middle may seem underdone, but cookies will set as they cool. This is such a unique cookie plus I love that it is for a great cause. Your description means I need to try them – they sound amazing. These sound so delicious! I actually DO combine fruit and chocolate as a first choice – always, lol! I’m really not a big chocolate fan without the sweet-tart contrast of the fruit. These cookies are right up my alley! Such a delicious sounding cookie. I got all excited about it and then a huge list came up of more cookies. You’ve made me very happy!